The modern society spends the majority of their time in mundane activities and the overall productivity is hampered as motivation decreases over time. As attention span decreases with passing years, executives are turning in their hour of need towards gamification. It has successfully increased employee engagement within an organization and improved the productivity and value of work. Consequently, a captivating gamification technology will help companies set a high bar for employee satisfaction. Gamification as a whole is a rising market trend with a prediction of 5.5 billion dollars market value by 2018. Companies have increased the utilization of this technology to drive employees towards a competing scenario that would amplify action in the corporate ecosystem. Additionally, it provides a platform for the executives to analyze and evaluate the performance of the employees enrolled in the gaming solution. Moreover, artificial intelligence is being integrated by gamification solution providers to enhance the user experience through augmented interface interaction. Like any other arena, the gamification landscape is flooded with myriad solutions and thus zeroing in on the apt one remains an uphill task for a CIO. To tread on the right path, Logistics Tech Outlook has become the torch bearer in the gamification solution landscape. 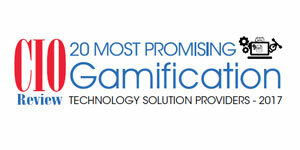 Our distinguished selection panel, comprising CEOs, CIOs, VCs, industry analysts and the editorial board of Logistics Tech Outlook narrowed the final 20 providers that exhibit competence in delivering gamification solutions.